Be inspired by these Jesus poems. Much has been written about Jesus, may these verses encourage you. He's a cute little boy in the manger with that peaceful look on His face. Notice the young, happy parents, it's obvious He'll bring them much joy. See the reaction of Joseph - he's nervous, the baby's so small! How do I hold this wee fellow? I'm afraid I might let Him fall! I've never held anything so tiny, He fits in the palm of my hand! He's soft, and sweet and so cuddly; He's smiling. Oh! Isn't He grand? She prays she'll be a good mother; she prays she'll be a good wife. See how he loves this wee baby - Jesus will have a good start. I'll live for the joy of the moment, though I know His fate has been sealed. We'll love and treasure each moment, delighted to spend it with Him. While Mary keeps knitting and sewing, He keeps growing out of His clothes. Feeling the strength in the lumber, watching how new things are made. Such pleasure He brought to His parents; but His ministry time has drawn nigh. The years were spent in preparing, now He must make His own stand. To heal the sick of the nations, to reach the whole human race. They didn't see Jesus as Saviour or the spirit of love He conveyed. The laws they diligently followed seemed now declared null and void. He came to bring full redemption but the Pharisees could not be stilled. Their methods were cruel and disturbing, and very few dared to resist. If they had only read Scripture, they might have sensed truth by and by. Christ can fulfill all your longings, He is the One who'll redeem. The fact of that cruel crucifixion still rested in God's mighty hands. 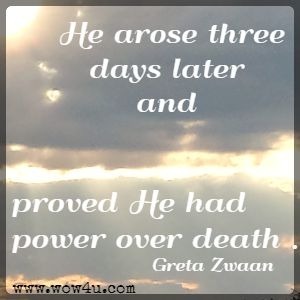 But then He arose three days later and proved He had power over death. Is worthy of all love and honour, He alone eternally reigns! Christ had better be stronger than me, else what is the meaning of salvation? If He were merely but a man, where would be new creation? Why would I strive to live a good life, only to find we are equals? If Christ has no power stronger than mine, then all ends; there's no sequel. No incentive to reach for high goals, and service left till much later. Why should one try to better mankind, giving them hope for tomorrow? If uncertainty looms on the edge, perhaps forebodings of sorrow. It's futile to try to better oneself or strive for a goal of perfection. A reason that moves us forward in strength, a call that seems to implore us. A grandiose scheme in the depths of our mind that we have the power to maintain them. A power much greater than what we possess, who’ll assist with our trials and our despair. When we are willing to humble ourselves, when we come forth in our meekness. That’s not a sign of weakness to Him, He stresses the joy of potential. We can be molded to fit in His plan, He has the strength to instill it. He'll not demand that we follow His rules, His joy is to walk close beside us. Remember the fact that He alone knows, He is the One who'll sustain us. Never demanding, it's of our free will, to respond or totally reject Him. 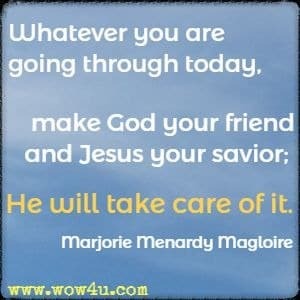 He will take care of it." It's not that I'm unhappy, that things aren't going well. My God has always been there, the God Whom I adore. A future wrapped in blessings, where light eternal beams. Where all our grief and sorrow are forever left behind. Prestige is not considered, possessions cannot mount. Where harmony is constant and sin has no recall. With saints from all the ages, with joy beyond compare. And burdens are all lifted, and sin has no more sway. To walk the streets of glory with Jesus, my best friend. Give praise! Give thanks! Rejoice always. An open invitation, precious gift, sublime. I'll tell Him how I love Him and have right from the start. Being in His presence, I tread on holy ground. He understands my weakness, my vulnerability. For He is not demanding, He lets me make my choice. I know I'm not consistent like Jesus is for me. There's no one else so faithful, my Lord, my guiding Light. My Friend, my Sovereign Jesus, now has a date with me. They must have talked it over, the Father and the Son. How would they solve this problem? Such damage had been done. Now lay 'neath sin's destruction, where Satan held his gain. But who on earth is worthy this evil to with stand? They're all contaminated - there's not one soul that's pure. We need someone who's holy, who's faithful, strong and sure." There is but one solution - Jesus, is it You? The 33-year journey because of man's mistake. To leave the joys of heaven, all privileges denied. Where harmony and honour their constant voices raise. Just as a helpless infant, our God of everything. This Holy King of heaven, no love was e'er so deep. That Christ, the great Messiah, the cry of man had heard. But swaddling clothes to dress Him, this tiny, dark-haired Jew. He nursed, like any baby, amazing! Christ the King! Our God! The great Creator! Could not do anything. Yet, all this had a purpose; yes, all this was God's plan. To set aside all glory, to rescue fallen man. 'Twas God's true, holy glory that could redeem the lost. Majestic in His glory, He lives eternally! If Christ were walking on earth today, would He be received by man? We are so tolerant of other faiths, it seems we've forgotten God's plan. And belittle the fact of Jesus' cross; don't offend, be nice, all is well? We would judge Him for the friends He has, not for planting faith's seed. Our tolerant society would nail Him again; for truth? We have nothing to say. Our faith is so weak, our witness so poor, that a trial would condemn Christ again. He'd be no better off in today's selfish world, He'd still have to suffer the pain. Give us a love for God and for man, but most of all let us be true. 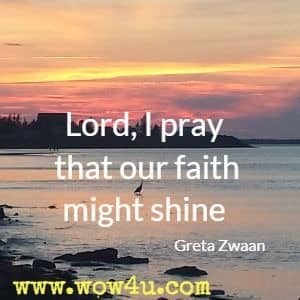 "Lord, I pray that our faith might shine "
That we'd be vibrant, verbal and true. That they'd be attracted to You. And through that be gently drawn in. That eternal life they might find. Forgetting that seeds should be sown. Mercy to set others free. The mountains of discouragements, the fight against the foe. The unknown things before me, the trials along the way. When trouble overwhelms me, I feel so torn apart. No earthly soul to guide me within this foreign land. Pour out my woes and anguish, my heartaches and my fears. I question, "Must I suffer while others live in ease? I walk the path You've chosen then slump down on my knees. Where have I failed or gone amiss? Where have I gone astray? Why is this thickening darkness encroaching more each day?" When I want your attention, response comes when you're weak. Gives way within your weakened state to let Me have control. But in your darkest hour you let Me close to you. It's just an indication of how these trials do refine. A living legend of My love, an understanding heart. Then, when your trials are over, you'll earn your golden crown."